This stylish love seat pairs beautifully with the coordinating sofa to create a contemporary-styled living room group. 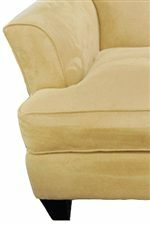 Flair tapered arms lend a slightly softer look to the love seat's frame. Tapered wood feet complete its base in true modern fashion. Two seat cushions trimmed with welt cords are paired with a tight seat back for the ultimate blend of comfort and support. Shown in Kensington Bisque, this style is available in assorted upholstery coverings. The 103A Contemporary Love Seat with Tapered Legs by Bauhaus at AHFA in the area. Product availability may vary. Contact us for the most current availability on this product.